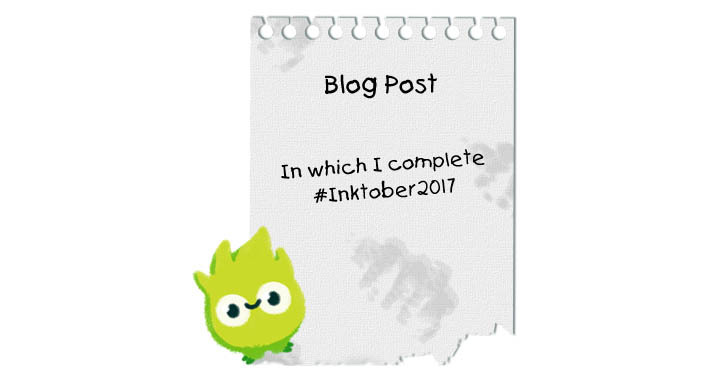 So it seems that last year’s Inktober attempt wasn’t enough to put me off doing it again! 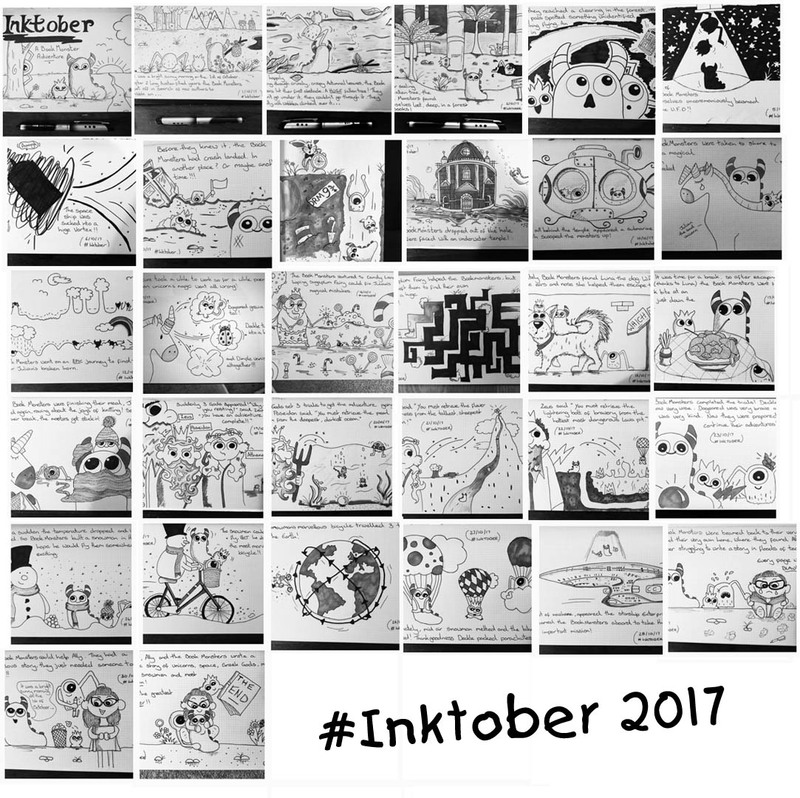 Inktober is an annual challenge to draw an ink based drawing every single day of October. 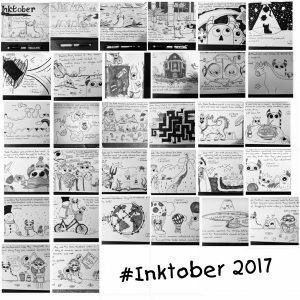 The official Inktober created by Jake Parker has been running since 2009. They provide official prompts which you can use if you want, but basically, there are few rules. Draw what you like, do it in ink, and do it every day of October. Last year I created a cartoon version of myself and doodled different situations each day. It was great fun to do. This year I wanted to push myself a bit further, and also involve all my wonderful friends, family and social media pals, so I decided to take the Book Monsters on an adventure, and asked you all to tell me what was to happen next on each day. My point, and the reason I wanted to write this blog, is that this was hard!! It meant I couldn’t pre-plan my inktobers, sometimes I didn’t know until late in the evening what I was going to be drawing for that day. It also meant I had less control over what I had to draw. So throughout Inktober I’ve had to attempt to draw a huge variety of things from forests, submarines, the Starship Enterprise, the Tardis, a unicorn the sugarplum fairy and tons besides. It meant not every picture was perfect, it took me out of my comfort zone, it taught me to have a go, and it made me put my drawing in the public eye regardless of whether it was good or terrible. At times I felt pretty bad about it. Who am I to be drawing and posting these doodles, when really genuinely talented artists are taking part and producing the most stunning inkwork? Who do I think I am, to place myself alongside these people? Is it right to even do that? Well by the end I decided that it’s not about how good or bad you are. It’s about learning, practicing, being creative, rising to a challenge, hard work and not being afraid to put yourself out there, even if it’s not perfect. I’ve received nothing but genuinely sweet, kind and supportive comments from people through the month. That’s what life should be about, having a go and accepting our imperfections. This is the example we should be setting to children. We can’t all be great at everything. What we do is different to the next person, not necessarily bad, just a different kind of different. Comparisons help no one, and giving up or not taking part in something we want to do through fear of not being good enough, means we suffer and we never dare to push ourselves. So thank you to everyone who encouraged me, egged me on, gave story ideas (even the ones I didn’t or couldn’t use in the end) they were all fantastic!! And a particular shout out to Gill Pawley and her Inkpots Writing workshop children, who fed me with brilliantly creative and bonkers ideas all month.